The son of a tailor, Simone Sacconi had no violin making ancestors from whom he could inherit a style or tradition; nor did he have a teacher who could instruct him in the higher echelons of the craft, despite being apprenticed to Giuseppe Rossi (see part 1). Yet he somehow acquired on his own a deep understanding of precision making, as well as the earlier ‘non-Italian’ methods of making copies, and the need for harmony of form in terms of both aesthetics and sound – far more than Rossi could possibly have been capable of teaching. 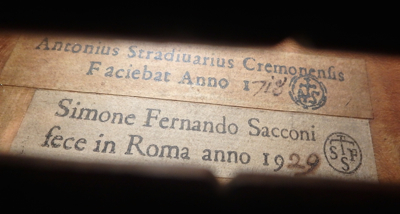 Giuseppe Fiorini arrived in Rome in 1923, when Sacconi was already a highly skilled craftsman. He was thus not precisely Fiorini’s pupil, but an admirer and collaborator with open eyes and ears. According to Giuseppe Lucci and Rodolfo Marchini, who knew Sacconi well, Sacconi helped the ageing maestro to complete some of his instruments in 1924–1925, in particular the finer detailing such as the purfling – a skill in which Sacconi knew no equal. 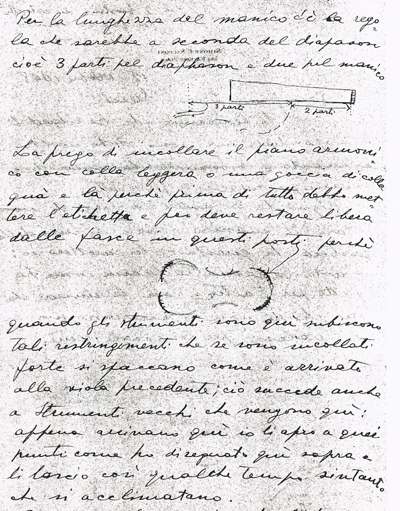 His close collaboration with Fiorini only added to his already substantial knowledge and reputation. Sacconi’s ability to grasp by himself the essence of fine violin making was not unique. A good number of famous violin makers, from Andrea Amati to Giovanni Pressenda, were largely self-taught and learned much of their craft through observation, experimentation and practice; others surpassed their masters to such an extent that they might as well have been considered self-taught. (Whether he is considered an autonomous pupil of Nicolo Amati or self-taught, Stradivari fits into this category.) In Italy such makers often became founders of informal stylistic schools, followed by their pupils or employees. Perhaps Sacconi was more methodical and fastidious in his approach to violin making than the average Italian luthier of the time, almost exclusively making copies and strictly adhering to the very structured methods generally associated with 19th- and 20th-century France and Germany. This has led to many critics branding his instruments as soulless or ‘the most French of the Italians’, lacking freedom of interpretation and spontaneity. 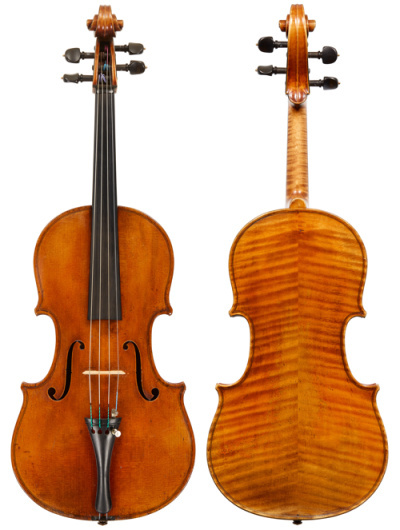 Whether or not Sacconi’s talent was constrained by his obsession with Stradivari, one of the basic distinguishing qualities of great makers is the uniqueness of the instruments they made, even if they are copies. This also guarantees that these makers will be recognizable by future experts, despite any later attempts to falsify their instruments. Some makers such as Antonio Gragnani, Giovanni Battista Gabrielli, Carlo Tononi, Nicolas Augustin Chappuy and Enrico Melegari, branded their instruments on the exterior. They and many others also developed personal models, perhaps also as a deterrent against future interference. The question thus arises whether Sacconi’s instruments are individual enough to be distinguished from those of other great copyists. Sacconi did often brand his instruments externally (discreetly at the end buttons) and his instruments were never made purposely to deceive, although he did allow himself the occasional brief jest at the expense of pupils or colleagues. Despite being copies of one sort or another, Sacconi’s instruments are no less recognizable than a Lupot or a Vuillaume, and are not themselves easily replicated or confused with someone else’s work of similar style. Most of his instruments are a little too good to have been made by someone trying to pass their work off as his, and despite his masterly antiquing, their approximate age is obvious to a trained eye. Unlike many French makers who worked on an external form, forming the rib structure inside it, Sacconi worked on the traditional Cremonese internal form. Some believe that achieving great results on the internal form requires more manual, intellectual and creative ability than on the external form, but it also tends to result in greater individuality in the product, and therefore a clearer expression of the personality of the maker. It is common knowledge that a large proportion of Bisiach’s instruments, particularly towards the second half of his production, involved significant collaboration with Iginio Sderci (see previous feature on Bisiach), but few are aware that a similar relationship existed between Sderci and Sacconi. 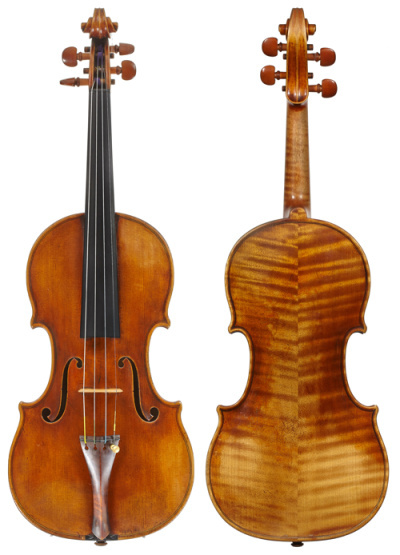 The Tuscan violin maker was 11 years Sacconi’s senior, yet apart from the Bisiachs, it was Sacconi who would later have the greatest influence over Sderci and his ability to market his work. Sderci was a prolific and skilful maker who constructed about 700 instruments independently and many more during his collaboration with the Bisiach family. He was not particularly skilled at sourcing the prettiest material or varnishing his instruments and this is perhaps why he never achieved the widespread recognition that in many ways he deserved, apart from winning a gold medal in the Cremona competition of 1937 (correspondence exists in which Sderci thanks Sacconi for helping him to win this medal). However, his years of collaboration with Bisiach provided invaluable experience, and among his contemporaries his woodcarving skills were probably only equaled by Ornati, Garimberti and Sacconi himself. Sacconi cleverly harnessed Sderci’s strengths and worked around his weaknesses by supplying him with wood and asking Sderci to make instruments in the white to his own specification; Sacconi would then varnish and finish them himself, not usually bothering with antiquing. Occasionally he allowed Sderci to do the finishing, but only using varnish that Sacconi supplied, complete with careful direction about how it should be applied. This arrangement was similar, perhaps, to the modus operandi of the Amati and Stradivari workshops or indeed that of Vuillaume and his pupils. Naturally this type of collaboration was never a highly publicized matter in any workshop and the level of cooperation between Sacconi and Sderci was perhaps less extensive than Sderci’s relationship with the Bisiachs. The fact that their collaboration was transatlantic, rather than within the workshop or at least within the same country, makes it unusual and possibly unique. The instruments themselves have a decidedly more commercial character than those entirely made by Sacconi, particularly his finest antiqued copies. Sacconi’s greatest copies show a hitherto unsurpassed and intimate knowledge of his prototypes. Most of these copies are distinctly ‘Italian’ and refreshing, combining the individuality of the original and the liberties Sacconi would sometimes take in the detailing, be it in his choice of model, the flutings of the sound-holes, or the deeper cutting of the scrolls. These features are very similar to the originals but are never quite the same as either the original or Sacconi’s other copies, whether because of some charming exaggeration of a feature or an incongruity that would not be present in the original. In short, these instruments do move one – more so than much of Vuillaume’s production. By contrast, Sacconi’s instruments are distinguishable from each other and unquestionably neither French nor German in character, while at least as precise in execution as the best non-Italian copies. Sacconi delved deeper into Cremona’s core than anyone else before him, particularly in Italy. He did not just copy specific instruments, but absorbed the general style from a particular period of Stradivari and, very rarely, Guarneri ‘del Gesù’, whose concept and aesthetic, especially from his later years, Sacconi never quite fathomed. On rare occasions he also made respectable copies of Guadagnini and Gagliano. Unlike most copyists before him, he was equally attracted to Stradivari’s later instruments as to the golden period models and copied them to perfection, regardless of the fact that these instruments are generally rougher and considered less valuable. Similarly with cellos, rather than sticking with the most successful ‘forma B’ cellos, Sacconi also copied the ‘B piccola’ Stradivari cello form, of which an exemplar is the ‘Benvenuto, Pawl’ of circa 1730. Sacconi seems to have enjoyed the process of varying his models at least as much as the knowledgeable admirer does when examining or playing them. There are, however, some instruments that fail to convince, either because one detects too much of Sderci’s perfect, but less inspired hand or senses a certain sterility, for example in the scroll or the varnish. This is probably a result of pressure on Sacconi’s time because of the breadth of his responsibilities within the Wurlitzer shop. Some of his later instruments, though clearly made entirely by him, lack the zeal associated with his best work and have a disappointingly dull varnish. Up to the mid 1940s, Sacconi apparently completed about 60 violins, 15 violas and 25 cellos. It is difficult to estimate how many instruments left his workbench thereafter, but despite his collaboration with Sderci, as well as occasionally with his pupils such as Luiz Bellini, production decreased considerably through the years. His total output is little more than 150 instruments during a career of about 64 years, most of which are copies of Stradivari (who by comparison completed hundreds more over a career of a little more than 70 years). Among these instruments are some masterpieces that are superior to most of the 20th-century’s production. As previously discussed, the school of making that Sacconi inspired, un-Italian as it was, preached that the best instruments were made by the great classical Cremonese violin makers or the finest copiers thereof. This belief has proved to be inaccurate in a variety of cases – both with old and with more recent instruments. One needs only to see some of the masterpieces of Guadagnini, Montagnana and the classical Brescian school to find makers who did not follow Cremonese principles or, in Guadagnini’s case, followed them without evident enthusiasm. Even Guarneri ‘del Gesù’ achieved his heights when he allowed his instinctive genius to hold sway over his training. Storioni, Balestrieri, Pressenda and Scarampella are among many later makers who demonstrate that, while it is important never to lose sight of what Cremona accomplished, it can be challenged by others’ intelligence and intuition. Indeed there were skilful and interesting makers, both before and contemporary with Sacconi, whose understanding of modeling and acoustics is at least as well regarded as his today. Despite this, many of Sacconi’s instruments are extremely impressive, even awe-inspiring, and what he achieved in his making, and in promulgating knowledge of the Stradivari workshop’s methods, remains unsurpassed. See Part 1 for Dmitry Gindin’s survey of Sacconi’s life.